Prominent & Leading Manufacturer from Rajkot, we offer hydraulic double pinch plate bending machine and 3 roll pyramid type mechanical plate bending machine. We are offering Hydraulic Double Pinch Plate Bending Machine to our clients. We are offering 3 Roll Pyramid Type Mechanical Plate Bending Machine to our clients. Model no. Plate Width(mm) Plate Thickness(mm) Top Roll(mm) Bottom Roll(mm) Minimum Bending Diameter (mm) Motor Power H.P. 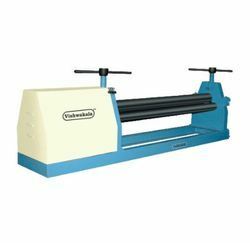 Looking for Plate Bending Machine ?